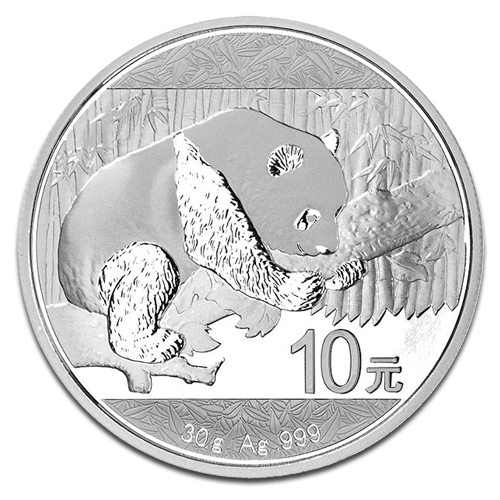 The China Silver Panda is valued by investors and collectors for its yearly changing design, its unique mint variations, and its purity. The 2016 Silver Panda will be issued as a metric coin for the first time and its new 30g (.9645 troy ounces) weight replaces the previous 1 oz silver coin. The purity of the Panda will not be affected and investors will still receive a full 30 grammes of .999 fine silver. Why buy 2016 China Silver Panda coins? Each China Silver Panda is guaranteed for quality and purity by the People's Republic of China and has a face value of 10 Yuan. The 2016 coin features a single panda resting on a bamboo branch with the Hall of Prayer for Abundant Harvests in the Temple of Heaven in Beijing on its obverse. As always, the coin will be produced by more than one mint including the Shanghai and Shenzhen mints. Chinese mints don't use mintmarks and instead, each mint produces a Silver Panda with a slight design variation, for example, font size or the length of the bamboo branch. Its yearly changing design and exclusive mint variations make the China Silver Panda a wise investment. silver-to-go.com buys 2016 China Silver Panda coins in bulk in packages of 450 or 510 and is therefore able to offer its customers the most attractive prices. We aim to ship coins as quickly as possible and all 2016 China Silver Panda are packaged discreetly and securely.